There is truly nothing like a slice of freshly baked bread. And these days, homemade ricotta and Bolognese are screaming for a crunchy, chewy piece of bread to sop up the from-scratch goodness. Store-bought sandwich bread just doesn’t cut it. Enter: Matt Pellegrini’s The Art of Baking Bread: What you Really Need to Know to Make Great Bread. When compared to other bread books I’ve read, Pellegrini’s language and vocabulary is clear and relatively concise—perfect for the novice bread maker. The step by step photographs are also essential for understanding tasks and techniques that can be extremely difficult to convey in words. His discussion of the science behind bread strikes a nice balance between elementary and informative for the non-scientists among us, like myself. In these ways, the book is a great companion for beginners eager to learn the art of baking bread. But I struggled with the organization of the book. The first section thoroughly covers the ingredients and equipment required to bake bread—not all of which are small kitchen or college friendly (I certainly didn’t own a baking stone or scale in college). The second outlines the basic steps to making bread: mise en place, mixing, kneading, bulk fermentation (first rise), pre-shaping and resting, final shaping, proofing and baking. Whew. And then come the recipes. While I understand that its critical to learn the techniques before diving in, it was difficult to fully wrap my mind around the recipes, as I was constantly turning back to other chapters. 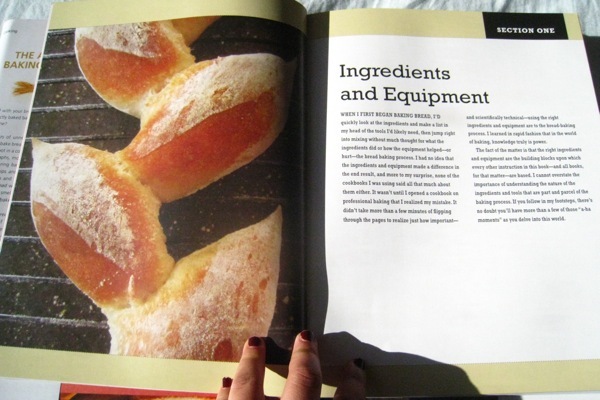 The recipes themselves are detailed, and properly supplement the techniques taught earlier in the book as they relate to a specific kind of bread. Since discovering Mark Bittman’s column on No-Knead bread a few years back (the most popular recipe in New York Times history), I’ve memorized the recipe and often bake bread on the weekends. While it took more concentration and attention than my go-to no-knead recipe, I was very happy with my attempts from the book. I made two loaves of Pellegrini’s straight dough recipe with great success. The texture was light and chewy, the crust crispy and brown. I was nervous about measure weights with a scale, kneading, and implementing all the “skills” I’d learned from the book, but overall it all proved simpler than expected. 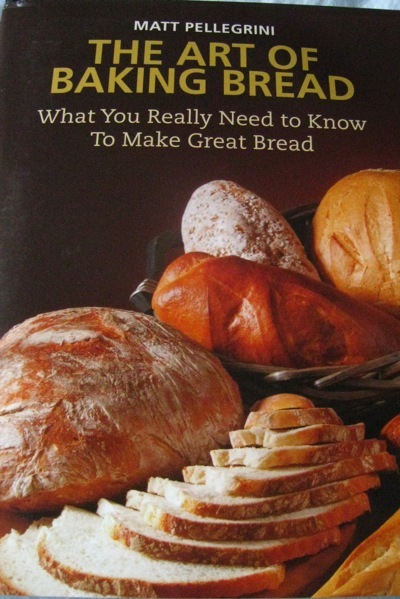 Don’t be intimidated by the techniques, equipment, or time—the instructions in this book are user friendly and the reward is loaves of fresh baked bread. How good is that? Measure flour into a medium-large bowl. Add the yeast to flour and whisk until the two blend together so the yeast is evenly distributed. Then add the salt and mix into the flour and yeast making sure it is incorporated. Pour water into the bowl. With a wooden spoon, dough scraper, or your hands, stir mixture until blended. Pellegrini notes to slide the utensil under the ingredients and lifting them up to the center/top to make sure no flour is left on the bottom of the bowl. Stir together until the ingredients begin to combine and look like “rags.” At this point, use your hands to form the mixture into a rough ball. When you’ve formed a rough ball, slide the dough onto a lightly floured surface to knead. Knead dough for about 10 minutes, until the dough’s consistency is elastic. For instructions on how to knead dough, check out this video. Once you’ve kneaded the dough, it’s ready for its first rise (what Pellegrini calls “Bulk Fermentation”). Place dough in a bowl coated with olive oil, and flip the dough so that it is also coated in oil. Cover the bowl tightly with plastic wrap, and place in a warm, draft-free area to rise for 30-45 minutes, or until the dough has just about doubled in size. After this first rise, place dough back on kneading surface and gently stretch into a square. Fold the left and right sides in, as you would fold a letter into thirds. Then take top end fold it one-third of the way across the dough. Repeat with bottom end. Flip the dough over and cup your hands around the dough. Use your fingers to pinch the edges together, and the dough will begin to stretch and tighten. Rotated the ball of dough and repeat pinching until the dough is seamless and comes together in the shape of a ball. Let rise in oiled bowl for another 30 minutes, then fold again using above technique. Then let the dough rest for 15-20 minutes. Cut dough into two pieces. Shape each piece into a boule by using a similar method to the folding above. Fold dough in half, then use your fingers to pinch together any edges of the dough. Rotate and repeat pinch until dough is seamless and comes together in a nice round shape. Next comes proofing, or the final rise. Place dough on lightly floured (your could also use cornmeal) baking sheet (I like to flip the sheet upside down to avoid the rim) and cover with plastic wrap. Let rise for 45-60 minutes, or until the dough springs back to the touch. If the dough remains dented after touching, continue to proof until it springs back. Place dough in oven and bake for approximately 25-30 minutes (could take longer depending on your oven). Test for doneness with a thermometer. Internal temperature f the dough should be about 200°. Cool bread on wire rack for at least an hour. My favorite thing to bake is vegan chocolate chip cranberry oatmeal cookies! I keep it classic – chocolate chip cookies. The process and product are a delight. My favorite thing to bake is muffins or cookies. Bread is super fun too! Nigella’s Classic White Bread recipe makes me feel like a baking wizard! my favorite thing to bake is jelly roll cake. Trying to experiment on fillings & frostings. This couldn’t have come at a better time. I just tried my hand at bread making two days ago without great results. The recipe tho was a little confusing. I love baking but have always been intimidated by yeast! My favorite thing to bake is chocolate chip cookies, maybe because they get over before they even cool at out house!